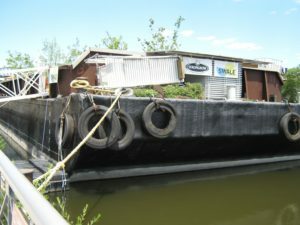 But now in the 21st century, Swale, a floating food forest built atop a barge, the latest “artwork” of visionary artist Mary Mattingly, challenges Whistler’s concern for “claptrap” when an artist’s art is not done primarily for art’s sake. This “artwork” or “fieldwork,” as Mattingly calls it interchangeably on her own website, has created positive change in a neglected city neighborhood by strengthening “stewardship of public waterways and land, while working to shift policies that will increase the presence of edible perennial landscapes” (as noted on Swale’s website). 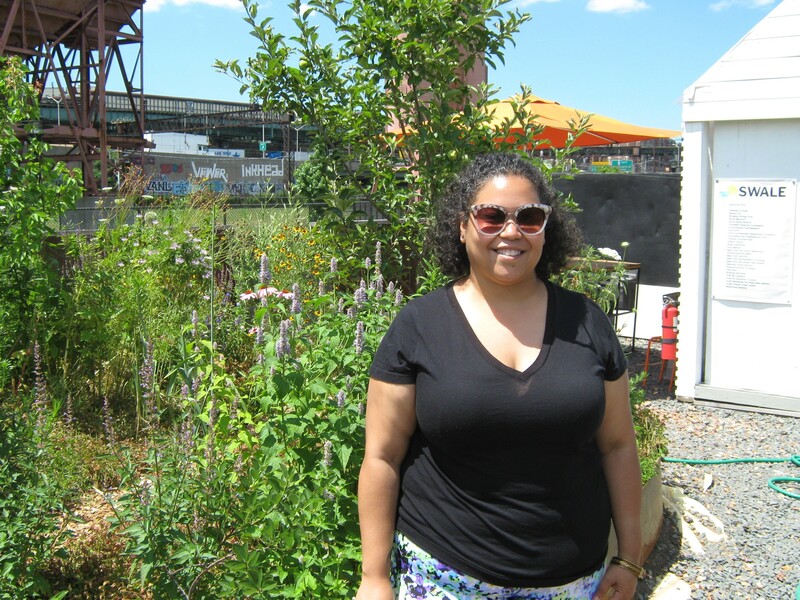 Swale was launched in the summer of 2016 at the Concrete Plant Park in the South Bronx. 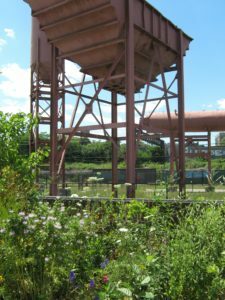 In 2000, the New York City Department of Parks & Recreation had acquired an abandoned concrete plant that was operational from the late 1940s through 1987. 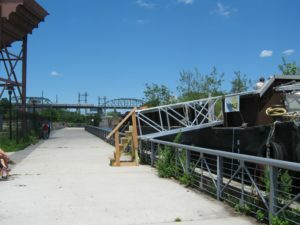 The abandoned site along the Bronx River in the past few years has seen salt-water marshes re-established on the riverbank and a kayak/canoe launch site created. 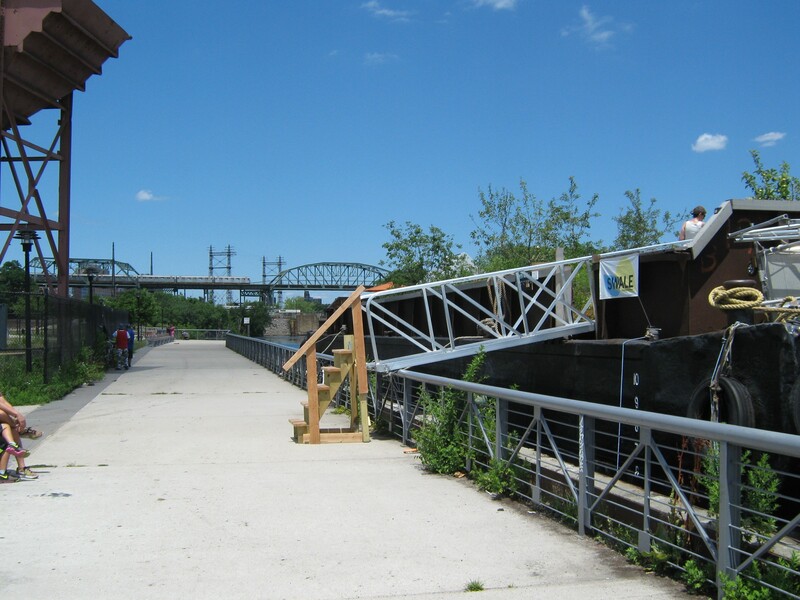 The 18.1 mile Bronx River Greenway bike path also runs through the unusual urban park. 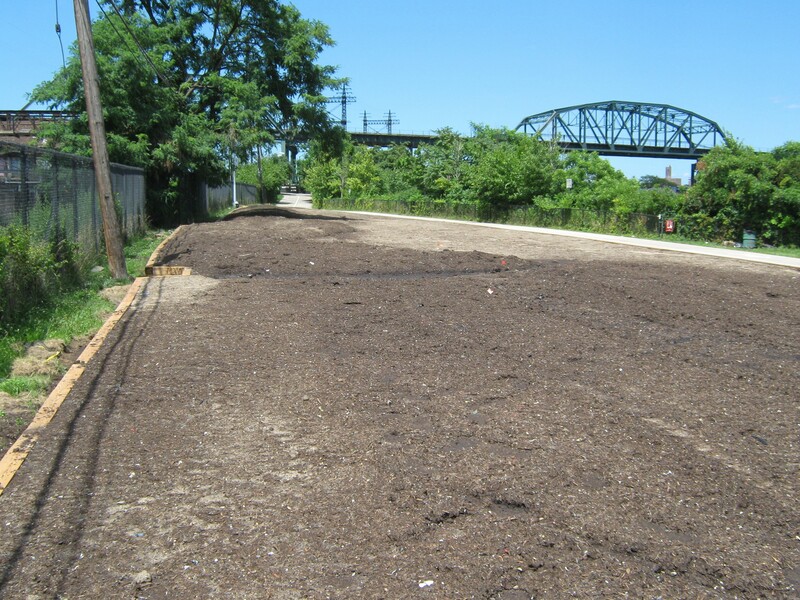 And one year after the launching of Swale last summer, a visit this July to the floating food forest at the unique city park (a couple blocks away from the Whitlock Avenue elevated subway station on the #6 IRT line), shows the floating food forest (and its herbs, fruits and vegetables) has become a site for the gathering of young adults working with Youth Ministries for Peace and Justice. 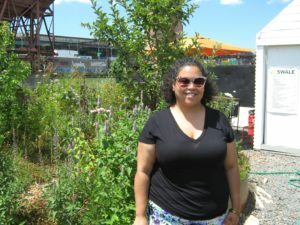 They share Swale’s bounty with folks in the neighborhood and interested visitors, and have plans to plant up newly established vegetable beds in the South Bronx park to grow food in a long-neglected post-industrial landscape. Also eye-opening, according to Dottie, the welcoming representative of Youth Ministries for Peace and Justice who greeted this visitor, participants in the Swale project have also learned the technology behind filtering the water of the stagnant Bronx River, on which the barge is afloat, in order to water their floating food forest. 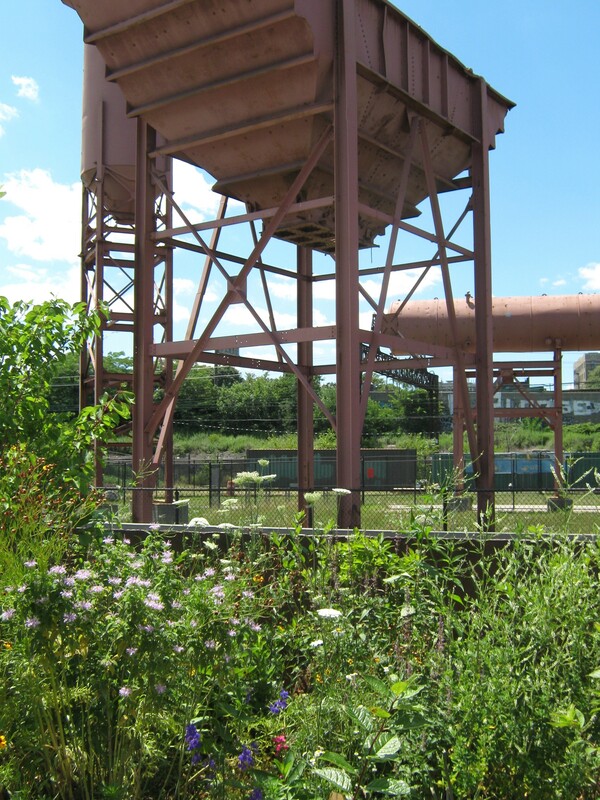 Swale’s slow sand filtration system is one of the oldest forms of water treatment still in use today. Participants learn about standard indicators of water quality: pH, temperature, nutrients (nitrogenous species), dissolved oxygen, salinity, and microbes in order to answer the question whether the water is clean enough for our plants. Swale’s plant community is made up of perennial native fruit trees and plants, and “what’s currently onboard” is described in detail on Swale’s website by these categories: canopy (beach plum, apple trees, persimmon, etc. ), shrub (red raspberry, blackberry, blueberry, etc. ), herbaceous (asparagus, anise hyssop, garlic, oregano, lettuce, etc. ), ground cover (thyme, oregano, strawberries, etc. ), rhizosphere (wild yam, Jerusalem artichoke, etc.) and vertical layer (hardy kiwi, hops, runner beans, etc. ).